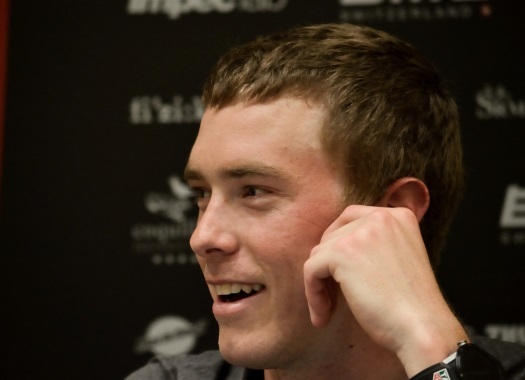 Rohan Dennis survived his first day in the Pink Jersey and will go into the rest day leading the general classification of the Giro d'Italia. The BMC Racing Team rider became only the 23rd rider to wear all three grand tour leader's jerseys, and never got into trouble as he defended his top spot in the last of three stages in Israel. "It feels really good," he said. "It was a stressful day though and in the end it was absolutely maximum effort to stay out of trouble and away from the splits at the finish line. Once again my team did a great job and kept me up the front." Victor Campenaerts, one of Dennis' key rivals for Pink, lost time in the third stage and dropped out of the top 10. "I think his efforts yesterday to take the Pink Jersey, trying to go on the breakaway and then doing the sprint with me and then trying to go on the break again, maybe he paid the price a little bit today. But in his defense, it was a hard part when he was dropped by the peloton. Anybody with slightly tired legs was gonna suffer today." By holding on to the Pink Jersey, BMC's first goal has already been achieved, according the Australian. "We're taking it to Sicily, that's a first big thing for us. But from now on, it's day by day, trying to keep it as long as possible. Then from the day that we do lose it, it's about fighting to Rome."